Reader's condemn the horrific Christchurch shooting that left 50 dead and many injured. People hoped for peace and harmony between nations. The mindless brutal killing of worshippers in the Christchurch mosque has once again highlighted the fragility of innocent human lives (“New Zealand attack: Alleged gunman may get ‘unprecedented’ sentence but dodge terror charges”, Gulf News, March 19). I am shocked at the impudence of this orchestrated attack. The government must immediately give assurance to the affected community by increasing security around mosques and community neighbourhood. Local religious leaders must assure people that they need to remain calm and not react impulsively, leading to escalation of the existing tense situation. Vindictive maniacs driven by hate and personal agendas will resort to devious extremism to accomplish their dastardly deeds. World leaders must take cognisance of this murder and appeal for peace and calm. Our hearts go out to the families of the victims. We live unfortunately in a chaotic world, constantly under the shadow of rabid terrorism. In most parts of the world, hearing gunshots has become a norm (“New Zealand Terror Attacks: Front line victim, finally able to breathe on his own”, Gulf News, March 19). People are killing each other because of hatred. We pray that in the future, people who have such thoughts and who wish ill for others are distracted by God. He needs to punish those who have eliminated others for no apparent reasons. Nobody deserve to die young, especially from a bullet. I request Muslims around the world, not to post any mean comments on social media, even though they are upset and emotions are high. Most people do not understand what Islam is. Many people do not come in contact with any Muslims and don’t know what kind of people we are. Islam has always given the lesson of peace. Islam spreads peace. Most people in New Zealand stand with Muslims. People are supporting the victims. The best example of this is the 17-year-old boy who egged Fraser Anning for his racist comments. 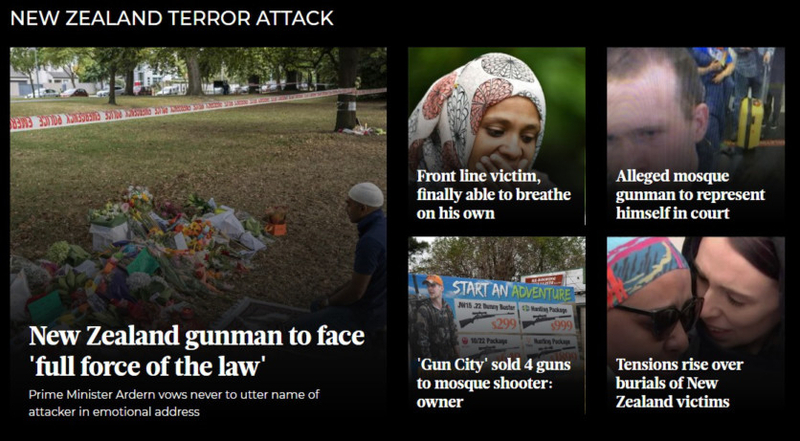 The brutal shooting that took place in New Zealand this week was heart wrenching (“‘Gun City’ sold 4 guns to mosque shooter: owner”, Gulf News, March 19). A gunman opened fire and killed 50 people. This orchestrated attack just proves how gun violence is a serious threat to society and how steps need to be taken to ensure this does not happen again. I was happy to hear New Zealand’s Prime Minister Jacinda Ardern and her strong approach towards stricter gun control. Many people lost their lives in the Christchurch shooting and families will never be the same. Let’s take a step to identify the problem and curb terrorism. The people who died had families, they had a purpose and one man destroyed the hopes and dreams of so many. Such incidents should not be repeated. I hope Ardern manages to change the gun laws in New Zealand. Maybe this can set an example for other countries around the world. We human beings have made rules for ourselves in the society so that life is lived in an organised and peaceful manner. Now that peace for everyone is at stake, such decisions and actions should be taken so that there is no room for hatred. We are all one and we are connected we are connected to each other in some way. Our decisions and rules are for the betterment of mankind, so that there is peace everywhere. We should love and care for each other, irrespective of any race, colour, creed or religion. We have only one religion that is peace. We cannot call such culprits Christian terrorist or a Muslim terrorist because terrorism has no religion, nationality or humanity. They are barbaric individuals. Animals have no religion, no caste, and no nationality and do not live with hate. They dwell peacefully in their habitat. The world will stand united and make strict rules against such terrorists who create man-made disasters. We cannot control or do anything about earthquakes, tsunamis and other natural disasters, but we can do something about such hatred and crime. We stand ready to extend all our support to the families of the victims of the terrorist attack in Christchurch. Pakistan is proud of Mian Naeem Rashid who was martyred trying to tackle the White Supremacist terrorist and his courage will be recognised with a national award thanks to Prime Minister Imran Khan. In the past, we have seen wars between countries that have started without any basis. Terrorist groups emerge and they attack and kill innocent people. Over time, hatred towards religious groups grow in Western countries and then a white person, labelled a right wing nationalist, murders innocent Muslims, exactly like what happened in Christchurch, last week. So, after careful deliberation, I conclude the following: To prevent innocent people being killed, irrespective of race, we need to remove these tyrannical, war mongering governments from power. It does not matter which country they represent, what matters is these power hungry governments are the reason why crime is on the rise. They create paranoia among people and are the reason why people are divided. I had tears in my eyes while reading the reports about the New Zealand attack. Forget religion, there is something called humanity, which seems to be fading. Humanity is dying and this proves that people are not aware that they have become violent animals or have lost their conscience while killing others in the name of religion. A true human will never even think of hurting others. The recent brutal attack which took place in New Zealand killed 50 innocent lives. These people were praying on Friday, when a man opened fire leaving many injured and missing. This was unacceptable and I condemn it. This was a hate-crime against Muslims. The New Zealand Prime Minister, Jacinda Ardern expressed deep sorrow for this incident and promised that the guilty will not be spared. I pray for the victims and their families. The Christchurch mosque shootings was an attack not just on human lives, but on our beliefs, ethics and identities. We stand with the families and loved ones who lost their lives in such a barbaric act. Being Muslim, we respect the New Zeland Prime Minister’s words of empathy and concern. They mean a lot not just to the affected, but to all of us, irrespective of our religion and nationality. International media and political leadership needs to show strong reactions. When a Muslim or a third world citizen depicts such savagery, the concerns are harsh and cruel. Why is the stance more lenient now? One incident of shots being fired on the Sri Lankan cricket team in Lahore, Pakistan, has costed us till today. No one was injured or hit but our cricketing grounds have remained empty since that incident. Third world citizens and in particular, Muslims, are deliberately denied visas and disrespected at the immigration counter in airports. So what’s the stance of western democracies now? The decisions and reactions cannot be biased. Every life of a living being on this planet is precious and every religion should be respected andwell-guarded.